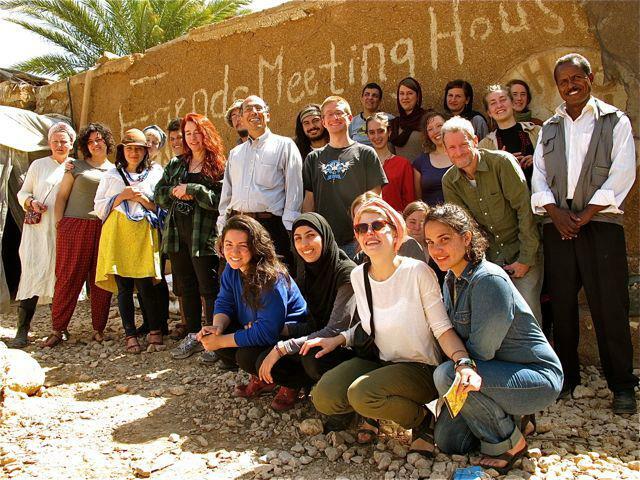 Hosted by Jordan Valley Solidarity, in the beautiful Friends’ Meeting House in Jiflik – the oldest building in the Jordan Valley – The Freedom Bus group heard talks from Mazin Qumsiyeh and Saed Abu-Hijleh about the history of Palestinian resistance, the nature of apartheid and personal experiences of living under occupation. Mazin opened his talk by questioning the idea of coming ‘in solidarity’ to Palestine. He argued that instead of thinking of ourselves as standing in ‘solidarity’ with the Palestinians, it would better to see ourselves as part of a global struggle, of which the Palestinian struggle for freedom is only one part. The same kind of people that are the cause of Palestinian suffering are the kind of people who are in positions of unjust power everywhere, he said. The problem in Palestine, Mazin argued, is not religious. It is to dowith money, resources, and greed. The Palestinian people are seen by the Israeli state as an obstacle in the way of resources. Mazin is the author of Popular Resistance in Palestine, a book detailing Palestinian resistance against colonisation from 1881 to the present day. He talked about the first Palestinian uprising in 1881, which used petitions, demonstrations, strikes, boycotts and lobbying to demand an end to colonization and the creation of a secular, democratic state. Arguing that these demands have been consistently made by Palestinians since this first uprising, Mazin put Palestinian resistance in the historical context of anti-colonial movements across the globe. There were further Palestinian uprisings in 1917, 1921, 1929 and 1936. The history of these moments of resistance is not well known. For example, the first demonstration to use automobiles was held in Jerusalem in 1929. It was organised by Palestinian women, who arranged to bring 120 cars from across the country into the Old City in Jerusalem, where they drove through the narrow streets, horns blazing. During the question and answer session, Mazin outlined the best ways in which internationals can help the Palestinian struggle. Firstly, he said, self-educate. Read and learn, so that you can make arguments and have discussions about Palestine and its history. Secondly, use the skills that you have. “I don’t want to see someone with excellent media skills planting trees,” Mazin said, “If you have specialist skills, use them.” Thirdly, he emphasized that the most useful work is not necessarily in Palestine itself, but in our own countries. Support in the West is key for Israel, especially in the United States and England. It is here that political work must be done to undermine this support. Saed began his speech by talking about his own history. Born in 1966, his formative years were spent under the occupation. In 1976, when he was 10-years-old, six Palestinians were killed in the ’48 territories during Land Day demonstrations. There were protests in response all over the West Bank. Shortly afterwards, a 15-year-old girl who was in his sister’s class was shot by an Israeli soldier. Along with other school students, he joined the demonstrations in response. In April 1982, when he was 16, an Israeli soldier entered the Al-Aqsa Mosque in Jerusalem and shot dead four Palestinians who were praying, injuring seven others. In response, there was a mini-uprising. On 27 April, Saed joined a demonstration in Nablus along with other students. An Israeli soldier machine-gunned him with explosive bullets. Saed was shot many times, and was lucky to survive. A few months later he was sent to Israeli jail. He was sent to Al Farah prison near Tubas, which was in fact a military camp used to hold activists from all over the West Bank. While in prison Saed was tortured, beaten and whipped with electrical wires. However, Al Farah prison brought activists from many different areas together, and they were able to forge links and learn from each other. This enabled them to organise nationally, rather than just locally. Saed’s descriptions of his life and experiences were extremely moving. Saed is also a poet and we were lucky enough to hear some of his poetry, which you can read here. This entry was posted in Daily Reports and tagged freedom bus, jiflik, Jordan Valley Solidarity, seminar by freedombuspalestine. Bookmark the permalink.